The Stark County ARES under the direction of Emergency Coordinator Terry Russ, N8ATZ operates a weekly training ARES Net. The purpose of the net is to facilitate the exchange of information and advise area amateurs of current news in the Emergency Services. One of the area's oldest continuously operating service nets, we have operated a weekly ARES Nets for over 25 years ! The Stark County ARES Net is under the direction of Net Manager Mike Palmer - KD8ENV, who manages the general operation of the net. The net convenes every Tuesday night at 7:00 PM local time. Initial check-ins are taken by roster roll call with preference given to low power mobile & portable stations. The net is then open to all listening stations and you are both welcomed and encouraged to check in. Please join us if you are in the area. Any traffic from the check-ins stations is then handled as well as any general announcements for the good of the general amateur community. This usually entails Hamfest announcements, net schedules, public service events to name a few. Did you miss last weeks report ? Click here to check out the latest edition..
Providing news of interest to the local amateur community and maintaining a contingent of highly trained & skilled Amateur Operators, this is the mission of your Stark County Amateur Radio Emergency Service ! Both the Alliance and Massillon Amateur Radio Clubs hold weekly information nets that you are encouraged to listen to and participate in. They both welcome check-ins from area amateurs. Keep up with local club happenings by tuning in ! In 1949 the ARRL created the National Traffic System to handle medium and long haul formal message traffic through networks whose operations can be expedited to meet the needs of an emergency situation. The main function of NTS in an emergency is to link various local activities and to allow traffic destined outside of a local area to be systematically relayed to the addressee. In a few rare cases, a message can be handled by taking it directly to a net in a state where the addressee lives for rapid delivery by an amateur there within toll-free calling distance. However, NTS is set up on the basis of being able to relay large amounts of traffic systematically, efficiently and according to an established flow pattern. This proven and dependable scheme is what makes NTS so vital to emergency communications. Click Here for a link to information on how to complete and transmit formal message traffic during a declared or simulated emergency. Thanks to the Wake County North Caroline ARES for the above link. 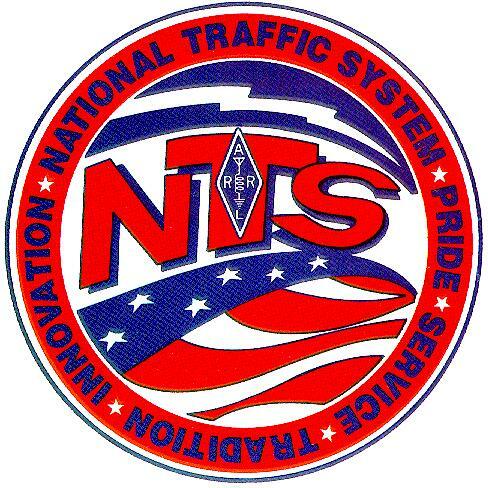 Thanks to the ARRL and the ARRL Operating Manual for the above information on the National Traffic System.